Franziska Landes – Environmental geochemist interested in applying, advancing, and teaching science. Environmental geochemist interested in applying, advancing, and teaching science. 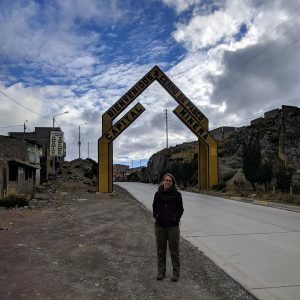 My name is Franziska Landes, and I’m a Ph.D. candidate in the Earth and Environmental Sciences program at Columbia University. I’m interested in environmental geochemistry and public health, especially the fate and transport of contaminants and the potential for community-based participatory research / citizen science tools to reduce exposure to these toxins and improve science education. My PhD research started with developing a field procedure/ test kit for bioaccessible lead (Pb) in soils. I’ve had the opportunity to travel to Peru to conduct soil surveys with a portable X-ray Fluorescence (XRF), organize a team of local interviewers, and present soil-lead information at community meetings. Our local collaborators are currently deploying the field kit through high school science classes in four Peruvian towns. More recently I’ve been working with communities in New York City, as well as a wonderful team of undergraduate students, to use the field procedure in Brooklyn and collect surface soil samples and soil cores. I see a direct connection between communicating science effectively and improving STEM education. As such, I’ve participated in a variety of Teaching Fellowships at the Center for Teaching and Learning at Columbia over the last four years, and am excited to be teaching a course I developed on Geochemistry and Health in NYC in Fall 2018. Before starting graduate school, I worked for two years at the Oklahoma Department of Environmental Quality, conducting and reviewing environmental assessments and remediation plans for the Brownfields Program. I received my B.Sc. in Earth and Space Science from Jacobs University in Germany.